At first, one might think that numismatic representations of the sun and the moon would be very obvious. Sometimes, they are. But not always. A star can be the symbol for the sun, but as shown in the other sections, a star might also represent a deity, planet, comet, or other entity. And while the first choice for a crescent symbol is the moon, the thin crescent of a partial solar eclipse may be depicted on the coin. The most important of the celestial objects was the sun, which was depicted as both a star or a disk on ancient coins. One of the earliest star symbols is found on 1/12 staters of Miletos (c.550 BC), and a solar disk with small rays is found on a coin of Uranopolis (c. 300 BC). To confuse the issue even more so, a wheel often was used to represent the sun, and/or the revolution of the entire heavens. The Celtic Cross, a cross within a circle that looks like a wheel, developed in the Carpathian region around 3000 BC as a sun symbol, and slowly spread across Europe. Shown below are two Celtic staters struck between 55 and 45 BC. One coin depicts a horse facing left, with a star and crescent below. The other has the horse facing right, with a wheel and crescent below. The reversal of the coin features suggests that one coin may have been copied from the other, but the star replaced the wheel, or vice versa. The crescent symbol was used to represent the moon, especially if the moon played a significant role, or a moon deity was depicted. In the section on planets, it was shown where a crescent and seven stars was most likely a lunar occulation of the Pleiades star cluster. But the moon also was taken as an omen for earthly events. At the Battle of Marathon (490 BC), under a waning moon, the greatly outnumbered Athenians drove back invading Persians to save Athens. On the classic owl tetradrachm of Athens, a crescent moon appears over the shoulder of the owl on coins struck after the battle. But the crescent may not have been the only symbol for the moon. In an ancient astronomical engraving from the Seleucid period (301-164 BC) in Mesopotamia, a deity slaying a lion was drawn within a disk that is associated with a cluster of stars. This is probably another representation of a lunar occultation of the Pleiades. Now consider a similar design on a 1/8 shekel of the Phoenician city of Sidon (372-358 BC). Here we see a man or deity in battle with a lion. Was this a symbol of the moon as well? Perhaps. Modern man looks at the dark lunar maria against the brighter surface of the moon, and visualizes a face, or "the man in the moon." 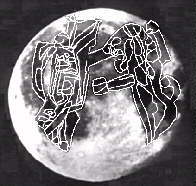 But a little imagination can align the deity and lion from the coin of ancient Sidon with the lunar maria as well. And now, we need to address one of the most difficult to analyze celestial events found on coins: a partial solar eclipse. Partial solar and lunar eclipses are not as spectacular as total and annular eclipses. In fact, a partial lunar eclipse is often missed by the casual observer, as clouds frequently obscure part of the moon in the night time sky, and a partial lunar eclipse would appear somewhat similar . But a very thin partial solar eclipse, especially if the sun is rising or setting with a "bite" taken out of a majority of the disk, is a sight to behold, as the atmospheric effects near the horizon make the sun appear larger and easy to observe. In the section on annular eclipses, a coin is shown where crescents and an annulet together make a strong argument for the correlation of the symbols with an actual annular eclipse. But when neither totality nor annularity occurs, then the only symbol that can be used to represent the partial eclipse is a crescent. On ancient coins, where lunar deities are common, it is very difficult to make the argument that a crescent represents a partial solar eclipse, rather than a deity. One example might be found on Boeotian coinage issued after the liberation of Thebes in 379 BC. A coin depicting Aphrodite with two crescents was struck. Partial eclipses would have been seen by the Boeotians in November, 380 BC, and in May, 379 BC. Are these two celestial events depicted on this coin? If the crescents represent the moon, why are there two of them? And another new symbol appeared on Boeotian coinage after the liberation - a star that represented the sun. Neighboring Athens had used a crescent for over a century to represent the moon, but the crescent had not been copied onto Boeotain coinage until two partial eclipses occured at the same time that Thebes was liberated. Medieval coinage with crescents presents less of an analysis challenge. Although the church discounted the widespread belief in astrology, medieval man rarely worshiped pagan deities. Therefore, a crescent symbol on medieval coinage would most likely either be a lunar symbol adopted as a mint or engraver's mark, or the representation of a thin partial solar eclipse. Even if the crescent were a mint or engraver's mark, a partial solar eclipse may still have been the event that caused the mark to be adopted. And a fairly rare partial solar eclipse would be memorable in medieval minds, where a lunar crescent was a nightly event. Consider a denier struck in Aquitaine during the reign of Edward II (1307-1325) that depicts a crescent in one of the quadrants of the reverse cross. Current numismatic literature attributes this coin to his father, Edward I, but research conducted by this author and Steve Ford, combined the astronomical evidence with mint openings, design linkage, and coin rarity, and demonstrated that this coin was struck after the 1310 partial solar eclipse that was seen in Aquitaine.